We just completed our first Chanuka in Israel, and I am on such a high. I can not be more thankful for the amazing week we had. I have not even had a chance to blog about our experience since we have been running from fun to more fun. Here are some of the highlights. Every year we hang up the girls projects from years past. I love taking out the box of paper driedels and Chanuka signs with my childrens’ adorable photos from when they were younger. BH we have obtained quite a collection over the years. This time it was especially meaningful for me to hang the decorations. It symbolized our past traditions and memories being continued on in our new lives. We set up our menorahs by the window, just like we have done so many times before. As my daughter so eloquently explained to her friend about why we were not lighting outside like many people in Yerushalayim do, we are not that Israeli yet. Maybe next year. Our first night of Chanuka was spent doing the traditional Chanuka things like playing dreidel, eating latkes and signing songs. The next night we planned to meet up with friends and go to a parade. I figured out the buses and timing and was ready to leave as soon as the kids got back from school. Then I was made aware of a security issue. To be honest, it hit me by surprise. I did not know how to react. Should we go anyway? After all, the security issue did not apply to our specific plans. Or should we stay home and take a more conservative approach this time. I spoke to a bunch of friends and family, and in the end I decided that if I was going to feel too on edge to enjoy the activity, it was not worth the hassle. Things happen for a reason, because it turned out that the parade was way shorter than expected and we would have traveled an hour by bus just to have missed the whole parade. Our plan B turned out to be a real success. We took a walk around our street and counted how many chanukiyot we were able to find. We spotted 159 on our short 20 minute stroll around the block. We were all shocked and amazed! And guess what? Not one Christmas decoration in sight. We all marveled at how many frum Jews lived right near us. The miracles of Chanuka was clearly surrounding us. On Tuesday we invited our “olim family,” as I like to call them, over for a Chanuka cookie baking party. There are three other families that made aliyah this year to Ramot with us, and I could not have gotten this far without them. They truly are a special family to us. We could not have celebrated our first Chanuka here without a party with our new family. All the children gathered around our dining room table and decorated cookies to their hearts’ content. We had a great time, and got to enjoy our hard work at the end with our freshly baked cookies. By Wednesday evening, my parents arrived from America to celebrate with us. My sister and her family as well as my parents piled in to our cozy living room for a pizza party and, of course, presents. Thursday was a bit rainy and cold, but we did not let it stop our fun. We made homemade playdough and then made our way to my extended family’s Chanuka party. As I have said before, I loved being a part of my Israeli family’s gatherings. We spent shabbat Chanuka by my sister with my parents and had a really special time with them. I am still not over living so close to them and being able to spend so much time together. It is a real perk of making aliyah! Sunday night was more partying. We took a bus to Ramat Beit Shemesh and enjoyed a yummy meal, some games and special face time appearances from some of our American family members. The Sunday before Chanuka was my American family’s Chanuka party. It was difficult for me to look at the photos of my nieces and nephews enjoying the party that we have attended for so many of the past years. This time the party went on without us. I missed our yearly grab bag and getting together with our family. My sister in law shared her Chanuka playlist with me so we could feel like we were part of her celebration and we listened to it all Chanuka long. For our last day of vacation, we went to pack food for the needy. Each of the girls received a box and a list of food. They had to locate the food on the list and pack it into their box. We had fun and did a great chesed in the meantime. Phew. That was a really busy Chanuka. I am exhausted just writing about it all. We had such a fun and exciting eight days. I read my children the post I wrote last Chanuka, Holiday of Lights, about how we were more focused on Christmas lights than on our own holiday, and I have to say, that was not even remotely true this year. This year was all about Chanuka and family time. I am so grateful to be able to live here and stay focused on our religion. 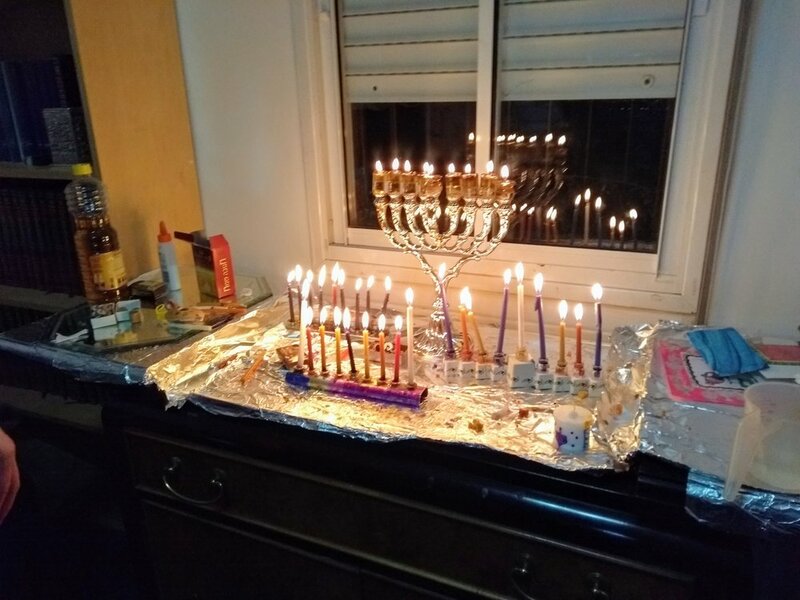 This year, each night of Chanuka was truly lit up! I chaperoned my first field trip last week. My daughter’s gan went to the Old City. When I heard about the trip, I had to pinch myself to make sure I was not dreaming - my five year old’s class trip was to the Kotel! That was their field trip. They were not going apple picking, or to the zoo, like they would have in New Jersey; they were visiting the holiest place on earth. That is our lives now. Pretty unbelievable! As a new, overwhelmed olah mom, I did not have the field trip days marked on my calendar, so I did not realize the trip was coming up. Actually, I did not even notice that any of their special activity days were taking place outside of the gan. When I saw a whatsapp reminder about the trip to the Kotel the next day, I was a bit unsure if I was able to understand the Hebrew text correctly. Were they actually going on a trip? And was it to the Kotel? What other information did I need? What would they need to bring on the trip? I was not even sure if I should send my child since I was so uncertain of the details. When my friend dropped off my daughter from school that day, I asked her if she knew anything about it. She said, yes, the gan was going to the Kotel tomorrow and that her husband was attending the trip as well. When my daughter heard that parents were able to attend, she insisted that I come too. But, it was the night before the trip and I had not arranged with the teacher. I played phone tag with the ganenet all night, but was unable to connect with her. So, as I thought an Israeli would do, I packed myself and my baby up assuming that we would be going on the trip, and planned to confirm that it was OK with the gan when we got there in the morning. Our morning routine was rushed so that we could make sure to be at the gan in time for the trip. Since the buses can be unpredictable, we left very early and were still not sure we would make it before the departure time. BH we made it with time to spare. When we arrived at the gan, I asked the ganenet if I could tag along on the trip, and she said yes. We discussed if it would be feasible with a stroller and one year old baby and we decided that it would be tricky but we would make it work. I was feeling super “go with the flow” Israeli, but then I saw what the phrase really meant: another mother was dropping off her daughter for the field trip and the ganenet asked causally ‘are you joining us today?’ Her response was ‘b’simcha.’ She grabbed some pretzels, a water bottle and a sweater from her car and was ready for a day trip to the Kotel. No bag packed or second thoughts, she was ready to go at the drop of a hat. Now that is something to aspire to! Our first stop was to the tunnel tours by the Kotel. As we walked past the Kotel, my daughter explained to me that her davening goes right up to a special chair near Hashem. It was amazing to be taking this trip with her and seeing how excited she was about davening and being close to Hashem. The kids sang their adorable davening songs right near the kodesh hakedashim and then got a chance to stand next to the wall to ask Hashem for anything they wanted. We all were fascinated by the humongous stones they used in the time of the second beit hamikdash and marveled at how they could have possibly moved them into place. Next, we walked to a gan in the rova for aruchat eser. The kids were given sandwiches and vegetables and a chance to play in the outdoor space of the gan. Our final destination for this trip was the Temple Institute tour. There we saw samples of how the bigdei kehuna and kelim looked in the beit hamikdash. Again, I can not stress enough how unbelievable it was to have such a meaningful field trip with kids ages four and five. As we walked around the old city, the kids were instructed to hold onto a long rope to keep everyone together. Honestly, it was a bit adventurous to bring so many small children through the crowded and windy streets of the Old City. Throughout our trip, tourists were stopping to watch and take pictures of the adorable children with their bigger-than-them backpacks. We even stopped to take a group photo in the rova and were photo-bombed by a Chinese tourist group. The truth is, it was a sight to be seen: around thirty cute four and five year old children going on a day trip through the streets of Yerushalayim. People from all over the world travel to see these amazing sights. We were those fortunate people that live close enough for it to be our regular lives and be able to take a gan trip to see it. I still can not believe that this is our reality! I can not believe it has been a whole year since I published my first blog post. So much has happened in one year. Our lives look drastically different now. It was eye opening for me to re-read my initial blog posts and reminisce about the beginning of our aliyah journey and our thoughts and emotions as we began to plan the biggest move of our lives. One year ago, aliyah was just an idea. My husband and I were just starting to think about if we could really pull off making aliyah at this point in our lives. We were very settled in America and thriving there, but we realized that living in Israel would be a more ideal life to lead. We had so many questions and concerns about making aliyah. We knew that if we could figure out some solutions, then we would ideally love to move to Israel, but we did not know how we would do it or if it was really something we should do with our family at this stage in our lives. This past year has been full of excitement and stress as we have unraveled the mystery. We took one step at a time and tried to figure out how we could or if we should make aliyah. Questions like which community would suit our family, how to pack up our belongings and send them to a new home across the ocean, and who to contact to network for jobs have all been answered. We have figured out so many things about ourselves and the aliyah process that we did not know one year ago. As I looked back on my list of initial concerns about making aliyah, I noticed that some are still haunting me today. I still worry about my children making friends. We wait anxiously for Sunday afternoon to come each week. Sunday afternoon from 3:30 PM, when the girls get home from school until bedtime at around 7 PM is the only time during the week when both my girls and their American friends are home and awake to chat. I watch as they giggle and video chat with their best friends and feel the guilt that we pulled them away from the people they love. Connecting with my friends in America is also very challenging. Finding time when my friends and I are both awake, at home and without kids around is nearly impossible. We have been working on finding pockets of time when we can catch up, but it is inconsistent. I hope we can continue to remain close with our friends from America and make new close friends here in Israel, as well. Additionally, I am concerned about how they are doing academically. Although they are making progress in their Hebrew, I hope they are not falling too far behind in their other subjects during this period when their main focus is learning the language. And maybe most importantly, I am worried about the long term effects that aliyah may have on each of us as a family and individuals. There are still so many parts of the klita that we are still working on. Just this morning, the new olim in our community met with a liaison for the city to discuss programs that could help our families with the transition. Ulpan and assistance in school was the big issue at hand. We also discussed a program that could help us learn the cultural nuances that we do not know inherently. For example, the foods we baked in America are very different from here. If we could learn some of the common foods Israelis make, we would be more prepared to send in treats with our children for school activities. We want to help our children feel like they fit in, and it will be less alienating to send foods familiar to their classmates. One year ago aliyah was just a dream we were hoping for, and now it is a reality. Over this past year, we made the big move. We took the leap and brought our family home, to Israel. We have come so far in just 365 days. There are so many more obstacles to overcome and questions to be answered. We are still praying that this transition will go smoothly and we will all be successful in the long term. It has been an incredible year and journey of coming home. I learned a lot this past week. Even though we are definitely getting the hang of our normal routine, we are reminded frequently that we are still learning the subtleties of the culture. For example, this morning when I dropped my daughter off at gan, the teacher smiled at my daughter and said “Boker Tov, Chodesh Tov!” She looked over at me, and told me matter-of-factly that it is Rosh Chodesh today. I responded that I was aware of that, and said my goodbyes. It seemed like an odd encounter. Did she think I did not know it was Rosh Chodesh? Why did she feel the need to make sure I knew that? It was only a few hours later when I received a WhatsApp reminder from Gan saying that tomorrow will be the special Rosh Chodesh lunch and don’t forget to wear a white shirt. Ah! That was it! My daughter was not wearing a white shirt this morning. I knew to send my older girls in white shirts, but I did not realize they have the same expectation in gan, too. Lesson learned - white shirts for everyone on Rosh Chodesh. Another interesting fact I have been figuring out is the school bathroom situation. On multiple occasions, my daughters have come home and told me about the lack of soap and toilet paper in the bathrooms. I went out a bought hand sanitizer and gave each girl a pack of tissues for their backpacks. I instructed that if they ever needed it, they had the supplies necessary to use the bathroom in school. What I did not realize was that I should send the girls with wipes and hand sanitizer when they go on tiyulim as well. I did not really think about the bathroom situation on a hike in the wilderness until one of my girls got home from her first trip. Her report was that they did a ton of hiking and that there were no bathrooms. My other daughter goes on a tomorrow; we will be better prepared for that trip! Last week I also gained the confidence to pass my bus card up to the front. Since I am usually with a stroller, I enter into the middle of the bus where there is space designated for wheelchairs and strollers. On newer buses there are rav card readers at each entrance and spread throughout the bus. On older buses, however, there is only one card reader next to the bus driver. I got on two of the older buses last week and asked someone to take my bus cards up for me. Both times the people helped without hesitation. Feeling more confident with this new strategy makes going on the older buses less of a stressful process. My last lesson of the week, but maybe my most essential one, was learning not to leave the house without my watergun. There is a cat that has been living in one of the planted areas in our building. This small cat is not afraid of clapping or stomping like most of the cats I have encountered around here. Instead, he is overly “playful” and likes to jump on people as they walk by. Due to my past experiences with cats, I would rather cats stay as far away from me as possible, to say the least. I definitely don’t want them jumping on me or on my baby in his stroller. With a little practice, we have learned how to spray the water gun at the cat to scare him off when we are coming. It is quite a sight to be seen when I take the kids out of the house. As soon as we open the door, we do a quick check for the cat with watergun in hand. Then one of the girls stands guard and sprays the gun as necessary. When the coast in clear, we hurry up the stairs. But we are not just being scaredy cats ourselves - we have escorted multiple guests up and down our stairs with waterguns shooting. So, along with my phone, wallet and keys, I now bring a watergun with me when I leave the house. When our aliyah plans became more definite and we booked our flight date, we started counting down the days to our aliyah. As the number of days dwindled down, the excitement grew. Once we got to Israel, we were super busy getting settled. There were so many “firsts” to experience. Our children’s first time to the kotel, our first big supermarket shopping, the first day of school, our first yuntif as Israelis, etc. etc. The first few months of aliyah have been a blur of running around and trying to take in the new experiences as they come. As one of my fellow olim and I just discussed this morning, this is when the reality is starting to set in. The dust is settling, and the craziness of making aliyah is calming down. We are getting into routines and starting real life here as Israelis. The days seem long and hard. There is so much we still do not know and do not feel comfortable with. My husband and I just spoke to my daughter’s teacher about how she is doing in school. The sentiment was that sitting through a whole day of Hebrew and not understanding the language is really hard. She is doing so well and trying so hard to grasp what she can, but it is a very difficult task. Back about a year ago when we started really researching aliyah feasibility, we spoke to a lot of people about the first year adjustment. Most people said that the first year is really challenging in so many ways, but kids are resilient. They claim that by year two things get significantly easier. We were very honest with our children about our plans of making aliyah and what that would mean for them. Both of our older children were concerned about the struggles of learning a new language and making new friends. As we talked about how hard it would be, we tried to encourage them about how the biggest part of the challenge is going to be short term and with Hashem’s help things will get easier and easier for them as the year progresses. We even went to the extreme to say that hopefully, by the end of the school year, living in Israel will feel like a piece of cake. The girls loved the analogy. And so, during that initial conversation, we planned that after the last day of their first year in Israeli school we would have a cake party. At the party, we would have tons of cakes and they would be able to have as many pieces of cake as they wanted. The cake party would be a reward for all the hard work they did over the first year and a fun event to look forward to when things got tough. We’ve spoken about the cake party on many occasions since then. Now that we are in the thick of our aliyah process, and things are getting hard, we started our new countdown. Giving us another fun and exciting event to look forward to as we struggle through our aliyah klita. This countdown is counting down until the day after school at which time, we will celebrate all our accomplishments and hopefully, by then we will be thinking that living here is a little bit closer to a piece of cake. Countdown to our cake party is now at 239 days. Now that we are settling into a regular routine, it has been easy to fill my time with housework and taking care of our family. It is almost easy to forget that we still have outstanding new olim tasks to take care of. For example, we just transferred our drivers licenses over to Israel this week. We hope to take care of our Israeli passports as soon as the three month wait time has passed. We are still working through a few kinks in our apartment and learning more about the medical system each day. Last week my girls were scheduled to get their vaccines in school. As planned, I accompanied them to school. We sat in a small auditorium-type area for almost two hours while the records were sorted out. Just as I suspected, my girls received their vaccinations in the U.S. on a different schedule than the one followed here. The nurses were not sure if my children needed to receive the vaccines again (which I was not planning to allow without further medical consultation). So, we waited while the nurses contacted their superiors. I got a chance to be a fly on the wall and observe the students and the school in action as they came to get their shots. The girls were nice for the most part, but more rowdy than I was used to seeing in a school environment. What really impressed me was how patient the principal was with the girls. They were clearly disturbing his office, and his reaction was to ask the girls to sing rather than scream. He was smiling the whole time, and very friendly. There was no yelling even when he had to return a few more times. After two hours, the decision was made to only provide my girls with the flu shot. Our immunization records were translated into a pinkas and now, hopefully we will be better prepared for next years vaccine day. After that day, two out of six of us received our flu shots. The rest of us still needed to go to the kupa to get ours. That proved to be a project on its own. When I went into the office two Fridays ago they told me the nurse’s hours and said to return then to get our flu shots. I brought my daughter and son with me on one of those days. When we got there I was told that they do not have the vaccines in that office. They said they might get them at the end of the week and I should call to confirm. I called three times and was not able to get in touch with them. I was advised by a few friends to try another office as they were more likely to have the shots. This afternoon we were in the mall running some errands. We were actually significantly later than I had hoped to be. I decided to run into the kupa one more time to check if they have the flu shots in stock. Surprisingly, they did! And the nurse was planning to be there at 4 PM. It was already after 3, and we had not done our shopping yet. We had been warned that after school nurse hours can be very busy, so by 3:45PM we went to the waiting room to make sure to be first in line for the nurse. When the nurse came and set up her computer, we each went in and got our flu shots. Only three attempts and 45 minutes of waiting later, but we were all vaccinated. I think my baby might have to return for a second round in four weeks, but for now we can check this off our to do list. Monday was our day to tackle the driver’s license conversion. We had planned to do as much of our driver’s license conversion as we could get done in one day, BH we were able to complete the whole process in a few hours! Since we have proof of being licensed in America for the past five years, we were able to take advantage of an expedited transfer process. Keep in mind expedited still means going to three different places. Our first stop was an optical store. We found one listed on the Nefesh BNefesh website that was supposed to provide something called a tofes yarok. The store opened at 9 AM, but the person who is able to provide these special green papers only comes at 9:30AM. So, we waited. By 9:30 there were about four other people in the store, but we were called in first. We gave the man our old teudot zehut. He asked us if we needed an eye exam, and we said that it was our understanding that since we were doing the expedited process we did not. He took our pictures, printed out a form and we were done with the first step. We walked to the DMV which was only about a seven minute walk from the optical store. We took a ticket and waited while the few people before us took their turns. When our number was called, we handed in our tofes yarok and old licenses and the man processed our temporary license. Next we went to the post office, paid for our licenses and asked the man behind the counter if we were able to drive with our Israeli licenses now. He smiled and said: “Carefully. In this country, drive carefully.” I smiled back and thought about how amazing it is to live in a country where people feel responsibility for their fellow Jews. Additionally, we noted that in each office, most of the workers wore kippas or covered their hair if they were married women. We even noticed a security guard stopping to say asher yatzar after his bathroom trip. What an amazing country we live in. Even the government offices are full of frum people. For me, it is important to try to do a few tasks each week. Each new thing takes research and multiple attempts to get it right. There are some really frustrating moments when I feel like I just do not know how I am going to do anything in this new country. When I start to think about all the things we still have not figured out, I get overwhelmed and discouraged. The key for me is not trying to do too many new things at once. So, I set small goals for myself. This week was drivers licenses and flu shots. Since those were both successful, next week I can move onto other things on my list. People like to ask me how things are going. They want to know how we are dealing with our transitions and how we feel about our aliyah experience. The truth is, my answer depends on the moment. This aliyah experience is like a roller coaster ride. There are highs, lows and twists all along the way. Some moments are so wonderful. During those moments we are so happy that we made the leap and moved to Israel. Other moments are difficult and stressful. During those times, I question our decisions and feel worried that maybe we are in too deep. For example, my husband likes to walk our older girls to their school and I take our youngest two to drop off our daughter at gan. We take the bus to her school since it is almost completely uphill and a difficult walk. Some days the bus is great and smooth sailing. We wait a few minutes, get on with plenty of space, have a rav kav card reader by our entrance, chat on the bus and get off a few minutes later without anr issue. Sometimes the bus takes a very long time to come, when it does come it is filled to capacity and we have to squeeze on. When this happens, we are pushed and shoved as people try to squeeze past our stroller to get on and off the bus. Sometimes the rav kav machines are only in the front of the bus. Then I need to leave my daughter with the stroller and make my way through the crowd to pay for our rides. When the second type of situation arises, the bus ride is stressful and worrisome. At those moments, I wonder how long I can handle such stressful mornings. I wonder if this is all worth it. My daughter and I usually take a big breath when we get off the bus, and discuss all the craziness that just went on. We walk up the hill to her gan, I give her a hug and she rings the bell to let her ganenet know we are there. I like to walk back from her gan. Our son loves watching the scenery as I push him down the hills of Yerushalayim. We both enjoy the breathtaking views. When I used to picture our lives after aliyah, I pictured walks like this. Strolling through Ramot is one of those highs in the roller coaster. Every so often we receive emails from the girls’ school with things we need to send in or do. This week, the school is providing vaccines for the second and third grade girls. Apparently in Israel, babies go to a special office called a Tipat Chalav for well visits and vaccines. After they reach two years of age, they graduate from the clinic. The next vaccines are given in school. This vaccine schedule and system is totally new to us. My kids like for me to be with them when they receive shots. Additionally, in America, the shot schedule seems to be different and they receive different vaccines at different times. The email requested that we send in the childrens’ pinkas which is a vaccine record booklet. Obviously, as new olim we did not have one. Yet another challenge to overcome. I am not yet comfortable sending my girls to school with the wrong documentation, and hoping they receive only the vaccines they actually need. This was a twist that we did not anticipate. I emailed one of my daughter’s teachers who understands a bit of English and asked her to forward our records to the nurse. Since I did not hear back from her about whether or not our kids required vaccines this year, I called the nurse at the school this morning. I explained that we are unsure how to compare our records to the vaccine schedule they use here in Israel and that I would like to be present when the girls get their shots. We arranged that I bring the girls a little late to school and we will go over the records together in person. I will be with my girls when they receive their shots, and I will be more confident that they will only be getting the shots they actually need. Crisis averted again (hopefully). Over shabbat we enjoyed a beautiful dessert picnic with some friends in the park. At one point a teenage boy started walking through the park yelling the word “tehilim”. All the children started to follow him. I turned to my friend and asked what was going on. Apparently, every week this young man runs a tehillim group in the park. All children are welcome to join as they recite tehillim line by line. When the kids are participating nicely, the leader gives them candy as a prize. What a beautiful program. This type of thing is why we moved here. Again, a high part of the roller coaster. To finish off the analogy is the feeling when you get when you get off the roller coaster. The feeling of exhilaration and gladness that you faced your fear and went on the ride. We are not finished with this roller coaster ride yet. I hope that one day, we will look back on our journey and feel that shear happiness, that we went on this roller coaster! Wednesday morning was our first day back to school and real life. As I watched my girls walk down the large staircase to their school, the feeling of worry returned. Since we had a nice long break from school, I had not worried like this in a while. Each time I send them off into the school building, I throw them a kiss and hope that they don’t get too overwhelmed by the difficulty of the day. We are blessed that each of the girls has students in their classes that speak English and can help them navigate through the day, but everyone else speaks Hebrew. They sit through hours of class and do not understand the vast majority of what is said. They go to recess and are surrounded by unfamiliar games and faces. As I stand at the top of the stairs and watch them enter into the unknown, I am astounded that they have smiles on their faces when the go and come from school each day. A few weeks ago we had a back to school night at their school. I had been warned that there is such a night and that it is important to go. But, since I do not get all the school emails and have difficulty understanding them when I do receive them, I missed the announcement for when back to school night was. Thanks to a Whatsapp message I received on one of the class chats, I figured out when back to school night was only hours before I had to be at school. I quickly texted my fellow olim and made sure everyone knew. Since I have a second and third grader, I had meetings at 5:30 and 6. I got a ride with a friend, and we walked into the second grade meeting a few minutes late. We quickly took seats in the circle, and started to tune into the teacher. She spoke clearly and slowly and I was able to follow most of what she was saying. Relief swept through my body. I was going to make it through the night. After the teacher had finished her shpeil, one of the parents started asking about continuing a program from last year. The teacher answered that they would. My friend’s husband raised his hand and asked what they were referring to. Obviously, as new olim, we were not familiar with last year’s programming. The teacher responded by saying she would explain it slowly and in English after the meeting. We were a little insulted. We had been listening to the whole half hour in Hebrew and had been doing fine. The teacher then went on to explain to all the other parents how there were new olim in the class that knew no Hebrew etc etc etc. I felt a bit uncomfortable as the parents all looked at us. I am sure this is only a tiny taste of what my children experience everyday. Eventually a father who had children in the school for years asked the same question we had just asked. He was also unfamiliar with the program from last year. The teacher happily explained, and we got our answer. I stuck around after the meeting for a chance to ask the teacher if she could switch my daughter’s seat. My daughter made a friend who was able to speak both languages and would not mind helping my daughter when necessary. My daughter had requested that her seat be switched to the one next to hers. The teacher agreed and I was finished with one meeting. I took a breath and was ready for the next one. Third grade was a whole different story. Since second grade ended late, I was late for the next meeting as well. I opened the door and noticed everyone was sitting in their child’s seat. A friend pointed to my daughter’s seat and I slid in. Her teacher spoke three times as fast. I caught every other word, and missed some of the main ideas. All I could think about was how could my daughter possibly sit through this all day. I know a lot more Hebrew than her (at least I do for the next few months until she surpasses me), and I was having a hard time keeping up. A mother raised her hand to ask about math enrichment for her daughter. That would have been me in America. My daughter excelled in school and we were always asking about ways the teacher could challenge her. This year, was a whole new situation. I was just hoping she would be able to grasp the basics and not fall too far behind while she learns the new language. What a new reality we were living. By the time I got home, I was home sick. I was ready to go back to our amazing chevra and school in Passaic. I was ready to sail into back to school night in my mini van, park in the parking lot, see my friends and make cute pictures to leave in my childrens’ desks. I was ready to be confident that my children were going to succeed in their education. I was ready to be able to ask a question without stumbling through the words. This was quite a different kind of night than I was used to. A few days later I made an appointment to meet with the guidance counselor. The Yoetzet, as it is called here, is a very warm and friendly person. She even speaks some English which was a welcome surprise. She spent about a half hour with my husband and me. The Yoetzet suggested that homework and tests not count for the first six months of school. She advised us to focus on math and ulpan and not worry too much about the other subjects. The Yoetzet reassured us that we moved at a good time, and that our daughters will pick up the language quickly. She helped us figure out which books we still needed to buy and where to purchase them. We talked about ulpan and our concerns. One piece of advice that I found surprising was to have one night a week for playdates. The Yoetzet differentiated between American culture of coming home after school completing homework, and getting ready for bed and Israeli culture where kids have playdates during the school week. She reiterated the importance of feeling social and making friends and suggested that we take up this norm as well. We resigned to make this part of our weekly routine after Sukkot. This morning, I spoke to my girls about trying to invite someone in the beginning of next week. When my girls returned home from school on Wednesday, they were all smiles as usual. They were thrilled that they were able to go on the hassaah - transportation. They were excited for Thursday which is when their ulpan teacher comes. They were excited to be back at school. Although we are not working yet, sukkot was a welcomed vacation from settling in. We enjoyed spending the first day with my side of the family. Chol Hamoed was sprinkled with seeing different relatives and enjoying quiet time with just us. I loved having time to reconnect with our girls. We played a lot of board games, took walks and chatted about life. It was especially meaningful to be able to visit the kotel over sukkot. As we rode the bus through the windy streets of Yerushalayim, we could not help but notice how many people were getting on with their lulav and etrog in hand. By the time we reached the kotel the bus was packed. I think every passenger got off at the kotel stop and joined the huge crowd trying to get though security. I just kept on thinking about how this was as close as we could get to doing the mitzvah of aliyah liregel. I explained the special opportunity to my children as we were pushed through the line. My daughter turned to me and said that she feels like we do more mitzvot now that we live in Israel. My smile was ear to ear. I was impressed that she felt that way. Walking up to the kotel with my three girls on sukkot, hearing hallel from multiple minyanim at the same time, seeing the tips of hundreds of lulavim from over the mechitza, this was one of those moments. Moments like this is why we made aliyah! A stomach bug crept through our family on the next few days of chol hamoed. Due to our illnesses, we were not able to go on any tiyulim or big trips this year. We all felt better just in time to enjoy our first Simchat Torah in Ramot. The girls loved dancing in shul. They even started their own small circle with some of their friends on the women’s side of the dance floor. My oldest daughter mentioned later, that she really liked how she was able to participate in the dancing. We shared a special meal with friends that helped us realize how nice of a chevra we have surrounding us. Yuntif ended on a true high! I can’t believe that what I am about to say is true, but it is. The hardest adjustment for our family thus far has been the morning cereal and milk situation. Back in America, we were a big honey nut/ multigrain cheerios and skim milk family. Although there are cheerios in Israel, they don’t taste the same and the milk only comes in 1% and 3%. Each morning we have the same discussion about what to do for breakfast. The cereal is not bad here, but our kids are not thrilled with the choices. Right now, we have a deal that everyone eats the multigrain cheerios for one week with no complaints and we will reassess the situation then. I am hoping that by next week everyone will be used to it, and our morning routine will go back to how it used to be. When people say children are resilient, I finally know what they mean. Our kids have gotten used to taking buses and walking everywhere. No one complains about missing the nice, convenient mini van (except for me, of course). The girls have adjusted to the new house and are finding fun places to play games and set up their toys. Our kids are starting to pick up words and phrases in Hebrew and discuss how to roll their reish’s properly. They are getting used to bringing two meals for school - one for aruchat eser and another one for the afternoon meal. They eat chicken and rice at school! Our youngest is enjoying the school food that is being provided. She likes to describe what she had for lunch by saying things like “I had chicken, some small bally things and corn.” She does not even know what she is eating, and the teachers can not tell her because they only speak Hebrew, but she is happy as a clam. We are even getting into a lice checking routine. Each Friday and some afternoons in between, I comb out each of my three girls’ long hair in search for the dreaded Israeli lice. In America, even combing hair caused tears. It did not matter how much conditioner or detangling spray I used, my daughters have very sensitive scalps and disliked brushing their hair. I had nightmares of what combing their hair with a fine comb in search for bugs would be like. Since it is a necessary part of living in Israel, I bought the recommended lice brush and explained the situation to my girls. First, I set the rule in place that when they go to school or public places their hair needed to be in a bun or braid at all times. Then, I showed them our special comb, and sprayed the detangler like crazy. Not one tear! My girls have risen to the occasion, and sit patiently while I check their scalps. I can not believe it! Watching my family fall into a groove with our new routines and realities is astonishing to me. I keep thanking Hashem for the amazing transition He has helped us with thus far and pray for it to continue. And I know that eventually we will all find something to eat for breakfast even if we can not have our Kellogg’s or General Mills!